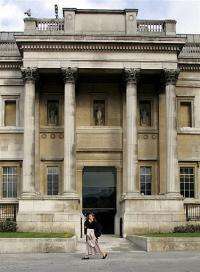 A woman walks by the Sir Paul Getty enterance to the National Gallery in London in 2004. Fans of fine art will be able to access some of their favourite paintings anywhere they choose through a new iPhone application launched Tuesday by the National Gallery in London. Fans of fine art will be able to access some of their favourite paintings anywhere they choose through a new iPhone application launched Tuesday by the National Gallery in London. About 250 of the gallery's best-loved paintings, including by Botticelli, Pierre-Auguste Renoir, Vincent Van Gogh, Rembrandt and Jan van Eyck, are available to browse, using the zoom function to examine them in minute detail. About 200 minutes of audio video content are also available on the application, including interviews and accounts of the stories behind the art. The gallery said it was the first museum to offer such an application, which will allow users to look at paintings at random or through 12 tours grouped by themes -- love and death -- or types. "Designed to appeal to art enthusiasts and fans of the gallery, this application is the first of its kind to be released by a major gallery," it said in a statement. BTW, the app is called "Love Art"; not mentioned in the article.